Ukraine’s armed forces suffered devastating new losses Thursday, underlining the scale of the challenge the country faces in quelling a guerrilla-style insurgency that has proven to be agile and ruthless. 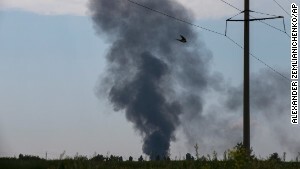 A rebel rocket attack brought down a military Mi-8 helicopter ferrying out troops, including a general, on the outskirts of Slovyansk, killing at least 12 people onboard. Acting President Oleksandr Turchynov told parliament in Kiev that rebels used a portable air defense missile against helicopter. Slovyansk, a city of 120,000 people, has become a focal point for the armed pro-Russian insurgency and has for weeks been encircled by Ukrainian troops. While Ukrainian forces may be better equipped than their opponents, fears that the standoff could degenerate into brutal urban warfare have so far held authorities back from ordering an all-out assault. In recent days, Ukrainian troops have taken to deploying mortar shells in their bid to retake Slovyansk, causing civilian casualties and prompting some residents to flee. The tactic has produced few immediate results other than deepening distrust toward the government and instilling fear. The Kiev government condemns the insurgency as the work of “terrorists” bent on destroying the country and accuses Russia of fomenting it. Russia denies the accusations, saying it has no influence over rebels, who insist they are only protecting the interests of Russian-speakers in the east. Ukraine’s military effort has been hindered by a lack of experience in waging operations of the sort underway in eastern Ukraine. The military, police troops, a newly formed National Guard and a number of often unaccountable volunteer battalions are all ostensibly operating under an “anti-terrorism operation,” but it is clear communication has been poor. And lack of military prowess among the most freshly minted units often shows. Bad coordination was most vividly on display on when insurgents attacked a government checkpoint in the town of Volnovakha on May 23. Aerial reinforcements apparently shot on their own men. Sixteen soldiers died. Rebels have also shown signs of disunity. On Thursday afternoon, dozens of fighters from the insurgent Vostok Battalion surrounded separatist headquarters in the regional government building in Donetsk — the most serious insurgent infighting to date. The standoff was apparently provoked by anger in the Vostok Battalion, understood to have many combatants from Russia’s North Caucasus, at reports of looting by their allies from a supermarket near the airport, the scene of bloody clashes Monday. Several dozen Vostok Battalion militiamen were killed in that fighting. The confrontation ended with the militiamen seizing the looted goods and bulldozing the barricades that have lined the building since early April, when the self-styled Donetsk People’s Republic announced its formation. On the government side, every deadly incident is only likely to sap morale among Ukrainian armed forces that have sometimes been shown to lack basic equipment. In one episode this week, reported by pro-Kremlin Russian channel NTV, the parents of conscripts serving at an Interior Ministry base in Luhansk region, where rebels have also declared independence, descended en masse to take their sons home. And acting Defense Minister Mykhailo Koval likely further soured moods by announcing Thursday that no troops involved in operations in east Ukraine would be rotated out as there is not enough personnel. Ukraine’s president-elect, billionaire candy magnate Petro Poroshenko, has promised to negotiate with people in the east but also vowed to uproot the armed rebels. He will not be in charge, however, until his inauguration on June 7 and has not spoken publicly about the insurgency since his victory speech Monday. The separatists in Ukraine have pleaded to join Russia, but President Vladimir Putin has ignored their appeal in an apparent bid to de-escalate tensions with the West and avoid a new round of Western sanctions. His spokesman, Dmitry Peskov, said Thursday that Russia has agreed to send “humanitarian aid” to eastern Ukraine. Meanwhile, at least one analyst argues that Ukraine’s military leaders will push for maximum and swift results before Poroshenko is installed and is given grounds for reshuffling top officers. Leonard reported from Donetsk, Ukraine. Laura Mills in Kiev, Ukraine, Vladimir Isachenkov in Moscow also contributed to this report.